The Colt Gold Cup National Match .45 acp one of the top pistols in the world, we are guessing that is where the name Gold Cup comes from. The O5870NM Colt Gold Cup in 45 acp has a 5" barrel, a magazine capacity of either 7 or 8 and of course one still goes in the chamber for a +1, it has a carbon steel blued slide and receiver so it is fairly uniform in look, it has a spurred hammer (the other Gold Cup model does not), 3 hole aluminum trigger system, wrap around grip, and a lowered and flared ejection port. This gun is a single action and has an approximate weight of 36.5 - 37oz with no ammo, and a full or overall lenght of 8.5". 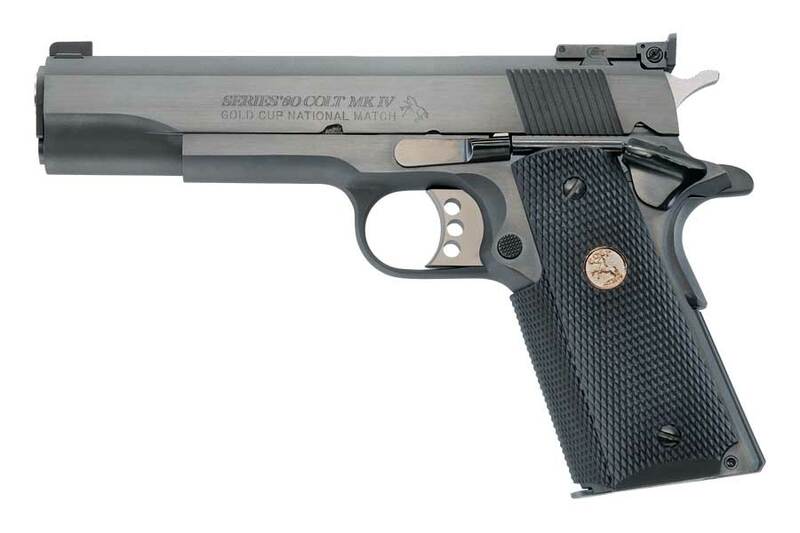 The Colt Gold Cup is known as the finest shooting semi-automatic in the world, and is the standard for competitive guns. The first Colt Gold Cup pistol was introduced in the late 1950’s to give competitive shooters a gun to take directly from the dealer’s showcase to the firing line. Colt Gold Cup pistols have been used to compete in local club matches through the National Matches at Camp Perry. It features an Adjustable Wide Trigger, National Match® Barrel, Adjustable Target Sights, and many other refinements as standard.